Patently Apple reports on some new patent applications that appeared in China's patent database this week. One diagram (above) clearly shows an Apple iPad with dual 30pin dock connectors allowing both landscape and portrait docking orientations. 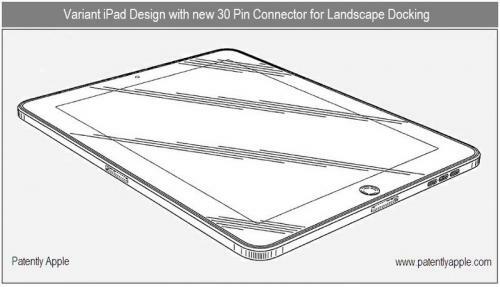 While the site seems to think this represents the next iPad, we feel it most likely represents existing designs that never made it into the current iPad. While the distinction may be subtle, it could mean that Apple explicitly decided against a dual dock design and we won't ever be seeing it a future model. In fact, dual dock connectors were strongly rumored for the first generation iPad by iLounge. Patently Apple also identifies the top sensor as a possible front-facing camera, though it seems more likely to represent the iPad's ambient light sensor which is located in that spot.